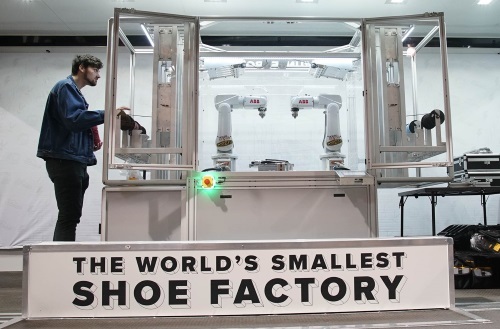 KEEN, an outdoor and lifestyle company based in Portland, partnered with House of Design, a robotics system-integration company from Idaho, to build the Uneekbot, what is now called The World’s Smallest Shoe Factory. When the American footwear company introduced its Uneek sandal back in 2015, bringing construction efficiency with a minimalist two-cord design and a free-moving cord junction that weaves its way through both the sole and a lightweight upper, it also started working on something as original as the shoe itself, a special robot capable of building custom versions of the sandal in front of the consumer in real time, anytime or anywhere. The high-tech system is essentially composed of two robotic arms, several custom fixtures, and a tablet which serves as the robot’s controller, allowing users to start and stop the shoemaking process or input important variables. “By bringing the manufacturing process to the retail setting, KEEN is challenging the status quo and engaging fans directly with a completely new in-store experience”, commented Tyler LaMotte, KEEN Vice President of Global Brand Marketing. Based on a consumer’s preference, the UNEEKBOT will be able to colour customize the key components of each UNEEK footwear, including the sole, EYEstay, heel, cord colours, hardware and bungee cord. 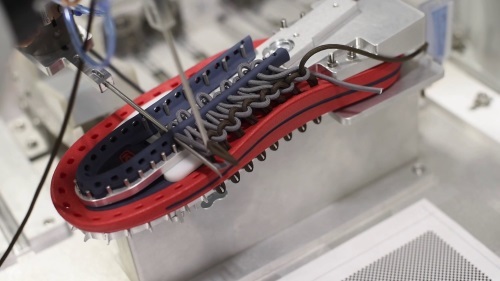 With an upper-making process featured by a repeatable pattern of two loops stacked on top of each other, the sandal’s cord-based design offered a great opportunity for robotics. Still, human assistance plays an important role through the whole process, since the loading of the sole until the final checks for quality control and finishes. In total, the manufacturing process takes 15 to 20 minutes with human and robotic assistance, of which six minutes are to select the correct spool cord and weave a sandal. At a cost of 300 000 US dollars per machine, Keen invested in three Uneekbots — located in Japan and at the company’s headquarters in Portland, with a third being built for the Netherlands location. The dual-arm robot has been fully operational since the summer of 2017, when it first launched in Tokyo, and after travelling through sports shows around the world, is now in a US tour to visit the top design, engineering, and business schools around the country. Connecting craftsmanship with the technology provided by the Industry 4.0 is frequently pointed as one of the most successful ways of ensuring a product differentiates itself from the competition in such a fierce market as the present ones. By going down this road "KEEN is trying to do it to anticipates the future of footwear manufacturing".